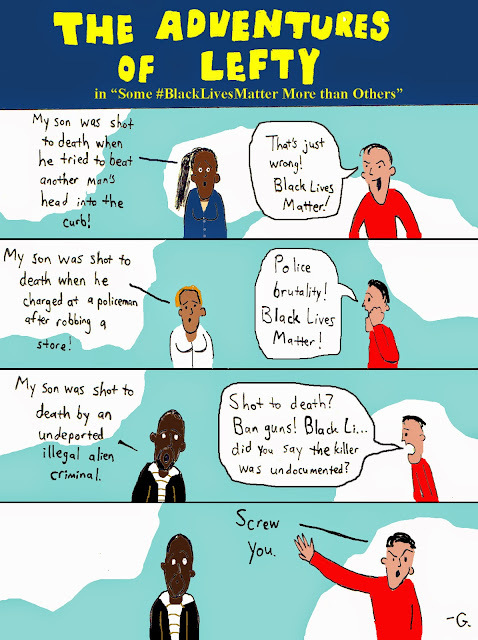 This cartoon is about the Jamiel Shaw Jr. case; a black teenager who was killed by an illegal alien who should have been deported but was not. You can read about it here. His father, Jamiel Shaw Sr., spoke recently to Congress about the problem of illegal aliens, including criminals, not being deported by a government that doesn't care to enforce the law. Lest anyone think this is mere Obama-bashing, Shaw was killed when George W. Bush was President, and the problem is much bigger than just one man, although Obama has gone far beyond his predecessors. The first woman is meant to be Sabrina Fulton, Trayvon Martin's mother, and the second Lesley McSpadden, Mike Brown's mother. The man in the final two panels is Jamiel Shaw Sr.
Lefty is the guy in the red shirt. One problem with the conservative movement is that too many folks are determined to believe in the good will of the other side, no matter how much the other side shows their bad will. This is especially a problem with The American Conservative, which has turned from a paleoconservative publication (Taki's and Unz.com seem to fill the gap) to essentially a wishy-washy pseudoconservative magazine that wants to appear reasonable. This particular article by Rod Dreher, where he insists that it is bad form for Giuliani to suggest that Obama does not love America, when he clearly hates America, at least in its current form, shows his extreme unwillingness to face facts. 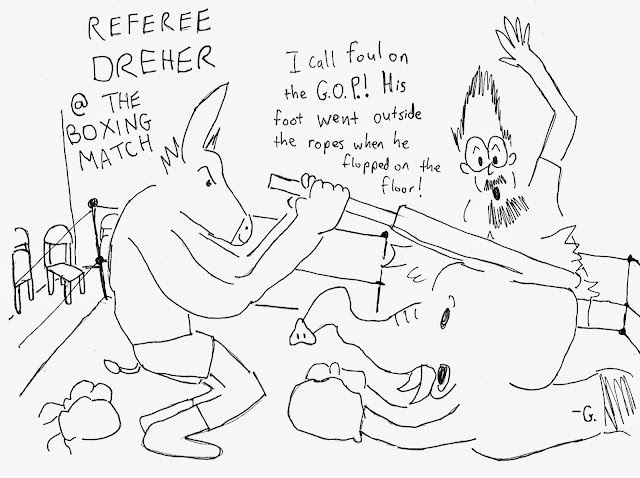 In case the cartoon is unclear, the donkey has taken off his gloves and is hitting the elephant with a folded-up folding chair, like the ones against the wall. After this post (I will be making a new post on the matter with a cartoon soon), I want to explain why, although I like Rod Dreher, I find him exasperating. Nothing left to do but pray that Anthony Kennedy will be charitable towards religious liberty when imposing the terms of our defeat. We see a man who wants to lose, or at least who doesn't want to fight to win. He wants to be able to say he lost gracefully and played by the rules. That's fine in a game. In real life, other than real moral rules (as opposed to strictures your enemy wants to place on you) you do what it takes to win when survival is on the line. Blogger 24AheadDotCom has long advocated for a plan to stop amnesty that involves publicly discrediting the people pushing amnesty. The idea essentially is to make it untenable to support amnesty by forcing amnesty advocates to answer questions publicly (or be seen explicitly not doing so). Along with this is the idea of trying to find people who support an amnesty advocate, and discredit the advocate in their eyes. One idea for this is the Stop Amnesty Challenge. The basic idea is to offer a prize to someone who asks a hard question to a prominent amnesty supporter on video. The goal is to make it a question that is resistant to glib responses, so that the amnesty supporter can't go into a pre-rehearsed answer and either looks like a fool or has to shut up or so obviously dissemble that they lose credibility. 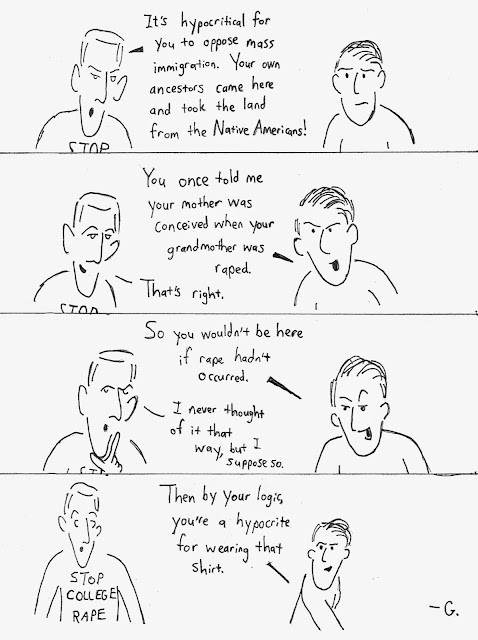 More importantly, the idea is to get people with influence (e.g., Ann Coulter) to do this. 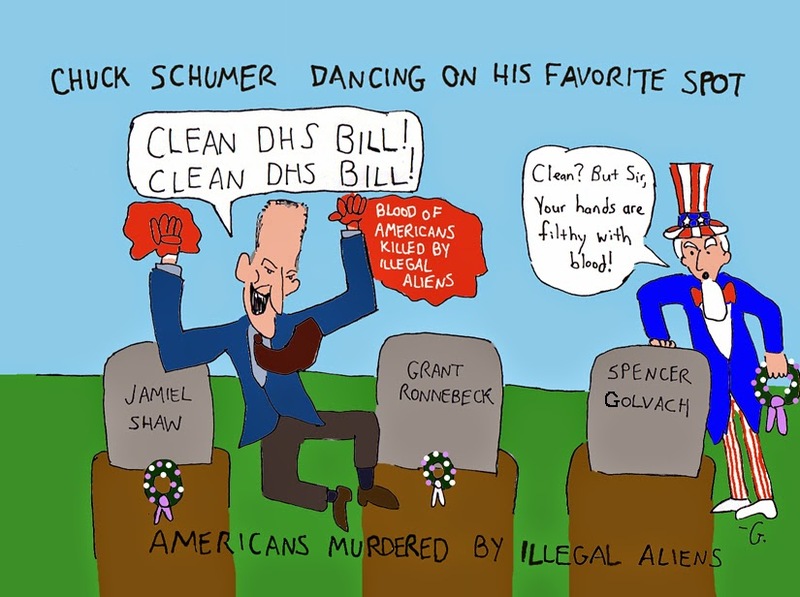 Most importantly, the idea is to discredit amnesty supporters to those who support them. Bernie Sanders or Richard Trumka are not going to care that Breitbart is against amnesty or that Fox News is (if it actually were). They will care if Huffington Post readers demand that columnists explain why they support positions that hurt working Americans (or if Huffington Post columnists ask the question themselves). The original idea for this used a cash prize of $350. While the original tilt bounty page for getting the prize has expired, I will continue the contest by agreeing to pay it personally. The prize is still offered to the anyone who will take it up (up to five people); I will pay the money upon confirmation that you have posted a video that meets the qualifications on YouTube. general qualifications are listed on 24ahead.com's old Tilt page here, in the "How Do I Claim the Bounty section. I will also award prizes for questions sasked of prominent non-politician amnesty advocates. Contact me to know if someone qualifies. I can be contacted on my Twitter account @Glaivester, my email Glaivester at Yahoo dot com, or by commenting on this post. However, the general idea right now goes beyond this specific contest. We need in general to demand that people with influence ask politicians these tough questions, and that lobbying groups such as NumbersUSA start campaigns to do so. This is a good start. So please, let's start participating in the Stop Amnesty Challenge today. Do I (a Former Charter Subscriber) Regret No Longer Subscribing to The American Conservative nor Donating to it? Here is my latest cartoon, lampooning Chuck Schumer. I'll grant that the labels are a little redundant and Uncle Sam is stating the obvious, but I figure that makes it a little more like the 19th century political cartoons beloved by history books. I suggest that anyone who defends Obama's bringing up the Crusades in his speech regarding ISIS should be asked, "would you mind if in giving a speech on Holocaust Remembrance Day, he insisted on juxtaposing the Holocaust with the firebombing of Dresden and the millions of Germans who died in the post-war forced relocations?"